If a permanent tooth is knocked out, you have a dental emergency that requires the urgent assistance of a dentist, if you are going to try and save the tooth. The longer a knocked out tooth is left out of it's socket the more likely will be the failure of trying to reestablish the tooth. While someone is making the emergency dental appointment for you, pick the tooth up by the crown, leaving the root untouched. Do NOT try and brush the dirt off the tooth. Do nothing that may further damage the root - leave the tooth roots alone as best you can. the knocked out tooth being successfully re-attached later. Once the tooth is knocked out of the mouth, the tooth is easily damaged by heat, cold or dehydration - tooth roots are very fragile. If the dental appointment is more than a few minutes away, gently try and replace the tooth into the socket that it came out of - teeth that are knocked out and that are replaced in their socket within 30 minutes of being knocked out, have a much greater survival rate. The tooth will have normally between two and four roots on it. Just face the tooth the right way round and try to gently push it into the socket - do not use excessive force. If the emergency dental appointment is within a few minutes or you cannot get the tooth back into it's socket, keep the tooth moist either by carrying the tooth in the mouth - preferably in an area of the mouth where it is unlikely to be swallowed from - or by carrying the knocked out tooth in cool milk. Once the tooth is clean and moist you can also wrap the tooth in glad wrap or other similar sterile plastic wraps to hold in the moisture. Once you are at the dentist, the dentist should be able to replace your knocked out tooth into it's socket. No matter what you do though, there is a real risk that a knocked out tooth has been severely traumatized and wont re-attach. 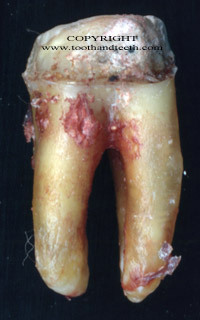 In other words, the roots are too badly damaged for the knocked out tooth to be saved. If there is more than one knocked out tooth. Follow the procedure for a knocked out tooth described above. If you are going to try and reinsert the knocked out teeth, you can try using the other side of your mouth as a guide as to which tooth goes into which socket. If the knocked out tooth or teeth have fallen into a dangerous liquid, like anti-freeze or petrol, quickly remove from the substance and rinse with cool milk. If no cool milk, sterile cool water, if no sterile water, then town water - but get the toxins off the tooth roots immediately.